This Big Agnes Big House 6 Deluxe Tent Review is about the new 2017 version of the great family tent with an impressive height. 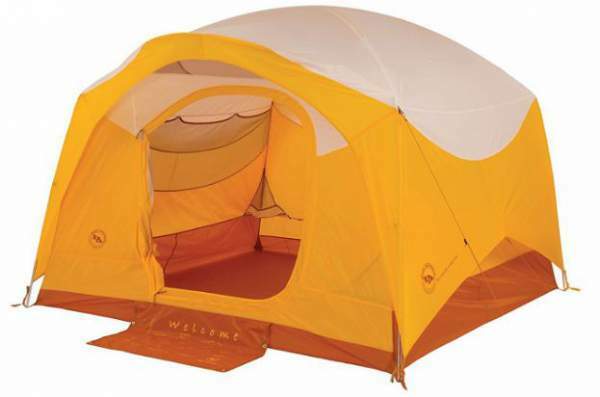 Big Agnes Big House Deluxe Tent. Very tall tent, almost 2 meters. Welcome mat on the front door. Huge number of interior pockets. Great carry bag with an organization for various tent’s parts. The Big House 6 Deluxe is a typical camping tent to be used at places with a car or motorbike access, for families and for groups of friends. Clearly, this can imply a variety of activities. The size is formally for 6 people, and its floor dimensions 112 x 96 inches (284 x 244 cm) show this. But this is a tent without vestibules so you do not have any external space for storage. 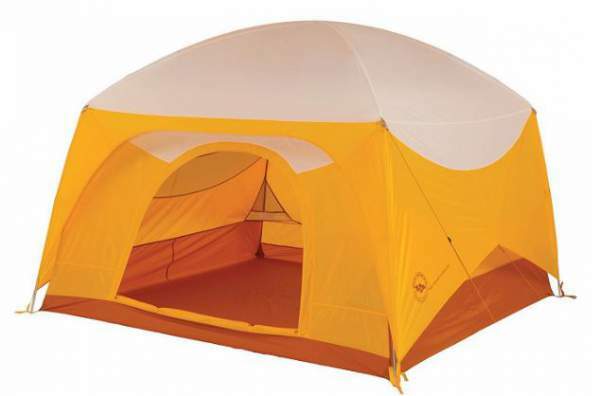 In view this, this is a perfect tent for 4, maximum 5 people, but see below about the accessory vestibule. 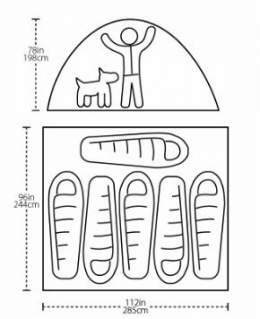 Big House 6 tent – dimensions. Clearly the most impressive is its height, and this is probably the main reason for the word ‘deluxe’ in its name. The pre-bent poles in the new version. This makes the wall almost vertical and increases the volume. The floor dimensions are different (the old version was bigger for 0.53 square meters), but the new version is 3 inches higher. The old version was lighter, with 5.53 kg packed weight. The mesh windows were more transparent in the previous version and there were more of them in the previous model. The carry bag color is different. So I am not completely sure why this new version is ‘deluxe’ as compared with the previous one; my guess is it is about the height and vertical walls only. This is a 3-season freestanding tent, two-layer tent, which means it is good enough for any normal use except for conditions with a lot of snow and exceptionally strong winds. There are two doors on the opposite sides, both with mesh windows and with rain flaps as well, and both are protected by an awning. Note that the doors open differently, one rolls to the side and one towards the floor. The tent with the fly. Here, the awning is created with the pole. Observe the mat. The tent comes with no less than 10 interior mesh pockets and 2 bin pockets, so you have plenty of space for organization and for keeping the things off the ground. You will need it, there is no external storage space here. Some of these pockets are visible through the doors in the pictures. Note that the fly is not full coverage as these two pictures show. The opposite door in a different style and with a different awning. The inner tent is with sleeves where you pass the poles, so this makes the structure a bit more stable. The rest is attached through the usual clips. The tent is with integrated gear loft loops and this is for the Big Agnes Large Trapezoid Gear Loft which you can order separately, see more below. The ceiling is with a lot of mesh so ventilation should not be an issue in this tent. Very similar is on the side panels, so you will have an optimal air circulation. I love the design of the carry bag, it is with several interior storage pockets so you store the tent elements separately, and you also have nice shoulder-carry straps. The tent is with two main lightweight aluminum poles with press fit connectors and color-coded ends for an easy setup. They create the usual X-shaped structure, but you also have a shorter pole which is added above one of the doors to create a small awning. Its function is only to protect the window on the door, so you can keep it with the mesh only even when it is raining outside. Note that you have grommets in corners which allow for the tent to be freestanding, but the package also includes 10 lightweight aluminum hook stakes for fixing the tent to the ground. The floor and the fly are both coated with 1500 mm waterproof polyurethane. This is perfectly enough for what it is designed, with sealed seams you will be fully protected from elements. They have used waterproof, solvent-free polyurethane tape for sealing. The vestibule can be ordered separately, see more below. Min weight: 12 lb 8 oz (5.67 kg). Packed weight: 13 lb 11 oz (6.21 kg). Floor size: 112 x 96 in (284 x 244 cm). Floor area: 75 sq ft (7 sq m). Poles: 2 main aluminum plus 1 awning pole. Walls: polyester and polyester mesh. Quick Stash on the front door. Multiple interior storage mesh pockets. Storm flaps on door zippers. Stowable bin pockets act as bedside tables. Velcro tabs connect fly to pole structure. Clearly, the Big House Deluxe is the lightest option here but it offers far less space than the other two tents. It comes without a vestibule so you have far less space for your gear. This can change drastically by adding a separate vestibule (but this is an extra investment of course). The prices of the three tents at the moment of writing this text are $241, 500, 400, quite drastic differences as you see. The footprint. The weight is 1 lb 3 oz (539 g) but this is not so important in general, this is a camping tent. The vestibule. With such an addition the tent becomes a truly luxurious space with plenty of protected room in front of it. Its weight is 3 lb 9 oz (1.62 kg), its height is 63 inches (160 cm), and you get 44 sq ft (4.09 sq m) of the area. Big Agnes Big House 6 Deluxe Vestibule. Big Agnes Big House 6 Deluce Footprint. I would say that the most important difference is the height, the bigger tent is high enough even for very tall people. But see also the price per person. To conclude this Big Agnes Big House 6 Deluxe Tent Review by stressing that this is a truly reliable tent from a brand which I trust and I can fully recommend it. Bear in mind some of the features if you plan to use it for a really large group of people, the comparison table above shows that there may be a better option from the same brand. But if this is about a family with two kids, or for couples who would use a queen size bed inside, you will have plenty of space and this tent is a great option. If you need something different, please check my page with tents and shelters, many great tools are described there, in particular this very affordable Kelty Outback 6 Person Camping Tent.